The particle size was an important factor that can affect the thermal degradation behavior of biomass during thermochemical conversion. 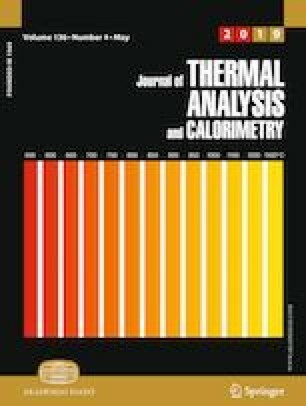 In this work, the thermal degradation behavior of flue-cured tobacco with different particle sizes for thermochemical conversion was investigated by a self-designed macro-thermogravimetric analyzer (macro-TGA) under inert and oxidative conditions. During pyrolysis and combustion, the thermal degradation behavior could be described by a four-stage and five-stage mass loss reaction, respectively. At the second mass loss stage, for six cut tobaccos, the mass loss rate increased with the decrease in particle size during pyrolysis and combustion. In addition, the combustion character index of cut tobaccos ranging from 3.0480 × 10−7 to 4.4825 × 10−7%2 min−2 °C−3 also increased with the decrease in particle size. Furthermore, the mass change data recorded by the macro-TGA were used to estimate the kinetic parameters, such as the apparent activation energy and the pre-exponential factor, based on distributed activation energy model. For the thermochemical conversion of tobacco materials, it was found that the apparent activation energy increased with the increase in conversion rate for pyrolysis reaction under inert condition, while the apparent activation energy reached a maximum within a certain conversion rate in the middle of combustion reaction under oxidative condition. As well, the kinetic compensation effect was evaluated by the equation \(\ln A = \varphi \times E + \psi\). The investigation on thermal degradation and apparent kinetics of tobacco revealed the effect of particle size on thermochemical conversion, which can provide a reference for building a more accurate cigarette combustion model. Financial support from the Key Lab of Tobacco Processing Technology of Zhengzhou Tobacco Research Institute (No. 212016AA0300) is gratefully acknowledged.